Consider a n x m rectangular grid. The problem is to find the number of shortest (or monotonic in this case) paths along the edges of the cell that start at (0,0) and end at (n,m). A monotonic path is a path always moving towards the goal, i.e. consists of moving up or right but not down or left. 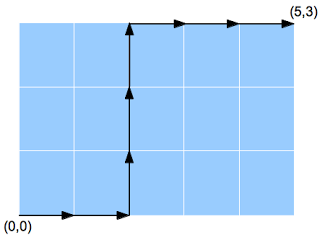 Figure 1 illustrates such a path for a grid of size 5 x 3. Now we need to print all monotonic paths that do not go above the diagonal y = x. Figure 2 shows such a path. Note that the path in figure 1 goes above the diagonal, hence not desirable in this case. How many such paths exist for n x m grid (n >= m)? 8C3 or 8C5 = 56 i.e., (n+m)Cn for the first one. Still figuring the second one. if(! (row>=col)) return 0; //--> this has been //added. Solving this problem in non-recursive call would be interesting. For the difficult puzzle: If m=n, the answer is Catalan numbers. Maybe it's possible to generalize that proof idea for m!=n? Let W(m,n) be the total number of ways of going from point (0,0) to (m,n) monotonically. Then S(l,n) = Summation from k=1 to k=n (S(l-1,k)). Then W(m,n) = Summation from l=0 to l=m (S(l,n)). W'(m,n) = W(m,n) - no. of paths which lie above the diagonal - no. of paths which cut the diagonal at (1,1) while going towards north - no. of paths which cut the diagonal at (2,2) while going towards north - and so on. W'(m,n) = W(m,n) - summation from p=0 to p=m-1 (W(p,n-m+2+p)). The second part of my first post was wrong..
W'(m,n) = W(m,n) - no. of paths which starts above the diagonal - no. of paths which cut the diagonal at (1,1) while going towards north - no. of paths which cut the diagonal at (2,2) while going towards north - and so on. W'(m,n) = W(m,n) - summation from p=0 to p=m-1 (W(p,n-m+1+p)). W'(m,n) = W(m,n) - summation from p=0 to p=m-1 [f(p)x(W(p,n-m+1+p))]. and f(p) = 2f(p+1) +1. For (3,5) the answer comes out to be 56 and 28. I guess the answer to the 2nd part is 47. Now, f(0,0) = 0 since we can't go north on the first step. Now, we can go to points (1,1), (1,2)...(1,5) from (1,1), but not on (0,0) because then we have to take a step back. And the points (2,3), (2,4) and (2,5) can be treated as normal points since there is no restriction on any three of them as y=x line doesn't interfere for any of these points now. The answer to second part is 28. E(m,n)= no. of ways of reaching coordinate m,n. Running time using dynamic programming is O(mn). Answer to the first part is number of solutions to the equation y1+y2+y3.....yn+1=m with the condition that yi>=0. It is the coefficient x^m in (1+x+x^2....x^m)^n+1 which is (n+m)Cm. for the second part there are extra constraints on y1 to ym such that y1<=0 y2<=1 y3<=2.....ym<=m-1. number of ways is the coefficent of x^m in 1*(1+x)*(1+x+x^2)....*(1+x+x^2+....x^(m-1))*((1+x+x^2..x^m)^(n-m+1)). I am unable to figure out how to evaluate the coefficient in the above expression by using binomial expansions( infinite series formulae) . If the above thing works we could have a general formula. Use following graph to visualise this. On the Xnew = X+Y, and Ynew as X-Y. Every step in new axis is 45 degree upward or 45 degree downward. And constraint will be that no point should touch Y=-1 line. Aim is to find #paths from (0,0) to (n+m, n-m). Take the reflection of (0,0) in Y=-1 line i.e. (0,-2). So, #path which touches Y=-1 line will be equivalent to #paths from (0,-2) to (n+m, n-m) (Principle of Reflection)and that will be (m+n)C(m-1). Assumption made in my previous post was that we can allow points on the diagonal but not above that. If we don't even allow points on diagonal then we can start from (1,1) (in new axis) to get total #paths and from (1,-1) to wrong paths.(i.e. 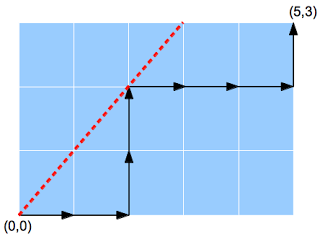 taking reflection along line Y=0). So, solution in this case will be (n+m-1)Cm - (n+m-1)C(m-1). Explanations for 2: flip every step after the first "up" arrow that goes across the diagonal, you will get a bijection to another problem where you will have a 6*2 board, whose solution is C(8,2). Subtract them out is the solution to the original problem. in quardinate geometry for (5,3) total moves in x direction is 5 and in y direction 3. We don't want to cross diagonal (0,0) to (3,3) here. In this case we count the faulty cases, where we are crossing that diagonal and remove this from total ((n+m)Cm) to get required answer. to get faulty cases , we can observe whenever we cross (0,0)->(3,3) diagonal , path will touch or cross diagonal (-1,0)->(2,3). Please ignore my previous answer.